"I got this great recipe from a friend and it has become a summer favorite! It is light and refreshing. Great as a side or as a light meal. Walnuts are a nice substitute for the pine nuts." Bring the water to a boil in a saucepan over high heat. Remove from the heat, and stir in the couscous. Cover, and let stand for 10 minutes. Scrape the couscous into a mixing bowl, fluff with a fork, and refrigerate until cold, about 1 hour. Once the couscous is cold, make the dressing by whisking together the salt, black pepper, red wine vinegar, and Dijon mustard in a small bowl. Slowly drizzle in the olive oil while continuing to whisk until the oil has thickened the dressing. 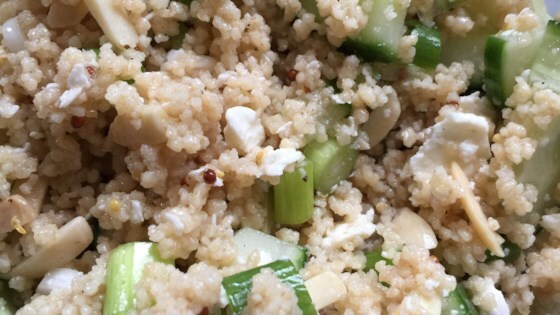 Fold the cucumber, feta cheese, green onions, parsley, and pine nuts into the couscous. Pour the dressing overtop, and stir until evenly moistened. Chill 30 minutes before serving. I swapped the pine nuts for fresh tomato and marinated the tomato and cucumber in the vinegar, oil and mustard mixture while the couscous cooled. I have to be honest I was a little skeptical the first time I made this....now it's a hit everytime I make it.